I have made some gift's for friends! First out is two small bags for Eva and Mona, and boy where they surprised to get them! Then there's a pincushion for Marta. She wasn't expecting anything either, so a big surprise for her too! I joined in on a Mother's Day Mini swap hosted by Cheryll, and after some issues with the post it arrived at my house. I was partnered with Wendy in Alabama and she made me this lovely mini! It's hanging in my kitchen right now. Here's the one I sent her. She says that she loves it and that make me so happy! 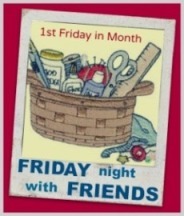 Tomorrow it's Friday Night With Friends again! And Oh boy if I have a lot to do! Pop over to Cheryll's and sign up you too! What beautiful gifts for your friends! Gorgeous goodies there! That owl pincushion is very clever, well done! such a cute owl pincushion...I have gotten so many lovely comments about the mini quilt you made for me.